The I AM SOLUTION provides practical simple steps to transform our negative or traumatic experiences into our greatest treasure. The power lies within us every moment of our lives to see our life through the lens of fear and suffering or with the eyes of LOVE and compassion. Love is all there is and all we have to do is realize it. Dr. Karmen Smith MSW LCSW is a licensed Clinical Social Worker wit… h over twenty years experience in the Child Welfare field. She specializes in repairing relationships between biological parents and their children after foster care. 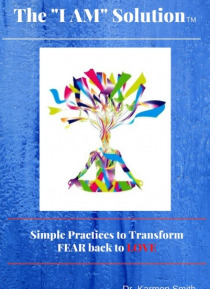 Her degree in mental health research/how the brain processes information and human biology provides the backdrop to show you how to transform fear to LOVE. She has explored over the years how trauma can change our identity by utilizing fear to sap our power to overcome challenges. Dr. Smith is a metaphysical minister with a Doctorate in Divinity which allows her to see the spiritual aspect that is essential in transforming trauma to triumph. Dr. Smith uses her own story of being homeless to describe the fear that can make us believe we are victims. She describes step by step the spiritual revelations that can change your life and the lives of those around you. The I AM Solution is knowing that everything you are is all that you need. Be the One to heal your life NOW.